WinterGreen Night Lights at ELC in Indian River County. VERO BEACH – The Environmental Learning Center of Indian River County will host its annual WinterGreen Night Lights on Saturday, Dec. 10, from 4-8 p.m. located at 255 Live Oak Drive in Vero Beach. 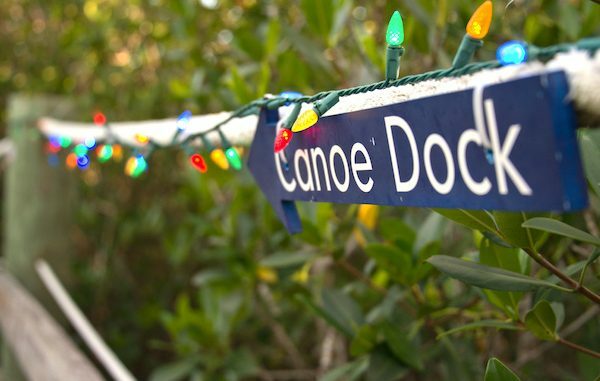 The ELC’s lagoon island will be decorated with holiday lights that can be seen by walking the trails with holiday music or by canoeing from the water. There’s nothing else like it in the world, and it’s right here in Vero Beach, Florida. Some people have called the attraction “magic” with its WinterGreen lighting and holiday music. While viewing the lights, there will also be holiday nature crafts for everyone to see, including pinecone birdfeeders, nature crowns and picture frame decorating. The WinterGreen night will also have its own Tropical Santa arriving at 5:30 p.m. with the Beachland Singing Sharks perming Christmas carols. The Sebastian River Middle School Madrigal Singers will also be performing from 7-7:45 p.m. Live music will be provided throughout the night by Boat Captain’s Blue Grass, Jingle Jammers, and Heart of Oak. Admission if $5 for adults and children 12 and older, and $3 for children 2-11. ELC members and children under age 2 are free. Getting to the ELC from Sebastian or Vero Beach is simple. Just take CR 510 and head east to the end of the Wabasso Bridge. You’ll see the signs for ELC and the WinterGreen holiday event.